Ben Killmeyer salutes during the ceremony Wednesday. He is joined by Parker and Mira. OSWEGO, NY – Just as they have done for nearly a century, Port City veterans, their friends, families and others gathered to pay tribute to those who have gone before them – especially those who made the ultimate sacrifice. 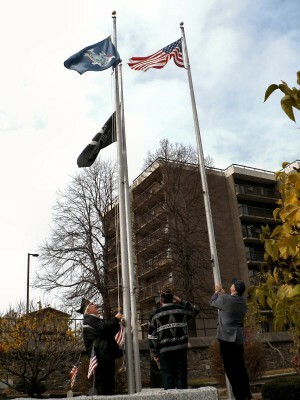 Veterans lower the flags Wednesday in Veterans’ Memorial Park, Oswego. The crowd, of more than five dozen, in Veterans’ Memorial Park Wednesday morning stood by reverently as the appointed hour neared. The temperature was around 50 degrees, but a cold wind was blowing in off the lake, the harbinger of things to come. Veterans’ Day is celebrated on the 11th day of the 11th month at the 11th hour; that’s when the (World War I) truce was declared, according to LTjg George Hoffman, USNSCC, of the U.S. Naval Sea Cadet Corp Truxtun DDG-103 Division in Oswego. A chaplain offered the Veterans’ Day prayer and the flags at the center of the park were lowered; the Oswego City flag was first. It was solemnly folded. The Prisoner Of War flag was next. 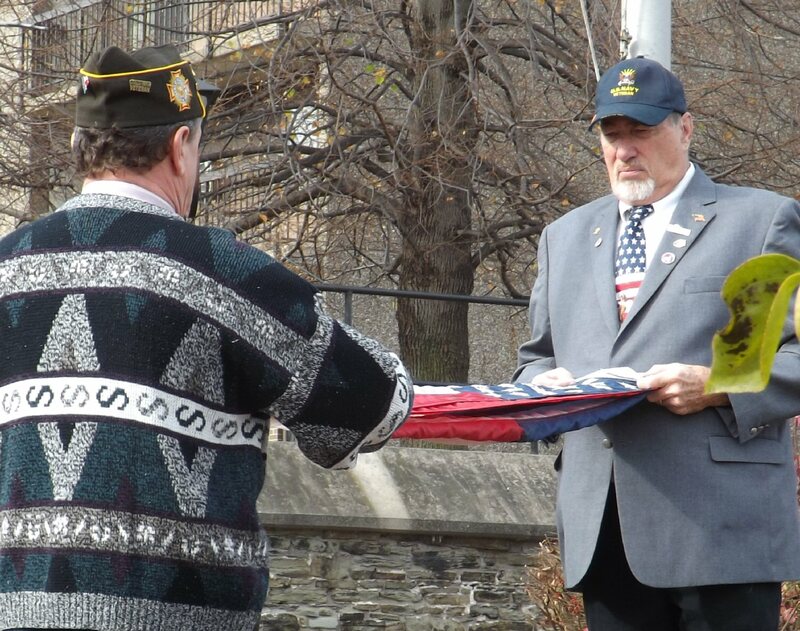 The flags were dutifully presented to Oswego Mayor Tom Gillen. Dan Ferens, whose father was a POW at Stalag 17 during World War II, lowered the POW flag in honor of his father and all veterans who were ever prisoners, he said. The mayor accepted the colors on behalf of the city. They will be stored over the winter and then returned to their place of prominence next spring on Memorial Day. Hoffman welcomed all the veterans and guests to the ceremony making a point to recognize Fred Crisafulli, a former veteran of the year, who is in a local nursing home. 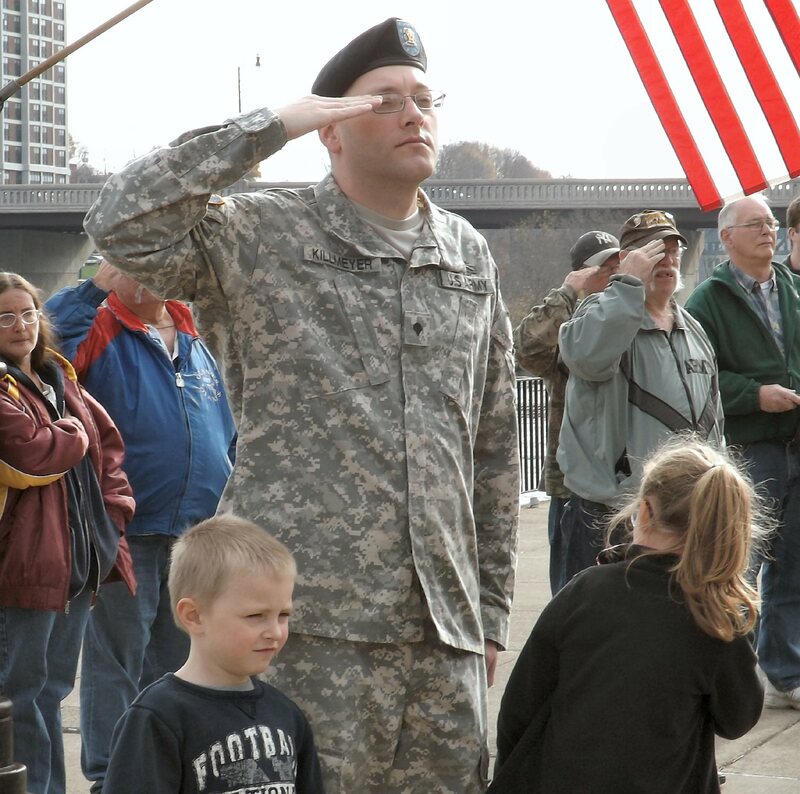 He saluted the veterans present at the ceremony and then also recognized the family members of service men and women who were in attendance. The veterans, he said, are ordinary people who responded to extraordinary times. “They follow in the footsteps of generations of fine Americans,” he added. This year marked the 97th anniversary of the first Armistice Day observance. It commemorates the Armistice back in 1918, after World War I, Hoffman said. It was signed at 11 a.m. on the 11th day of the 11th month, he explained. “Today is a day to honor veterans. 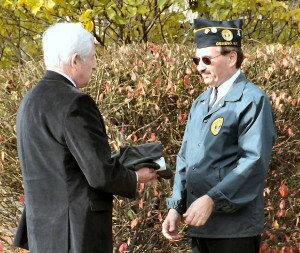 So, if you see a serviceman or veteran, make sure you thank them or even give them a hug,” he said. Dan Ferens, right, presents the POW Flag to Mayor Tom Gillen. “To those soldiers, sailors, Marines and Coast Guardsmen who have stood guard in peace time and to those who have seen the terror, the horror and inhumanity of combat and those who paid the ultimate price – let it be said that our fighting men and women have been there for America and the entire free world,” Gillen continued. Oswego’s park is the site of the first free-standing MIA – POW monument in the nation. A monument, honoring those who served as part of Operation Enduring Freedom / Operation Iraqi Freedom (Iraq and Afghanistan), was added in 2013 to the memorials to veterans of the nation’s other wars.